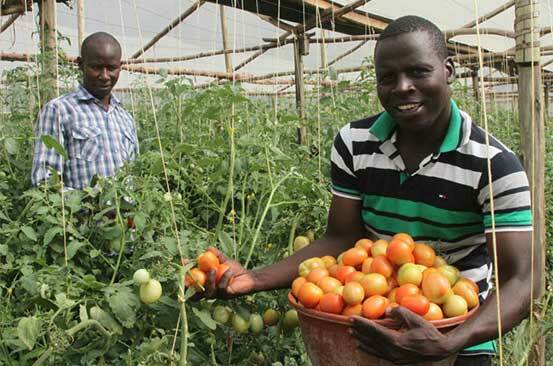 Samwel Mola’s farm at Urudi in Nyakach, Kisumu County has become a case study for prospective growers seeking to venture into commercial farming. Ever since it was established three years, some residents of the drier parts of Nyakach have visited it to seek expertise on how to effectively shift from rain-fed agriculture to irrigation. The farm is a modest affair and when Mola started out, he began with a Sh180, 000 greenhouse and purchased seedlings worth Sh8, 000. From the greenhouse, Mola harvests 300 kilogrammes of tomatoes every week. With a kilo selling at Sh50, he makes Sh15, 000 from his four greenhouses, translating to Sh60, 000 monthly. “The quarter acre land parcel we purchased has become a success. My farm now serves hotels and households throughout Nyakach, with the surplus making its way to markets in Kisumu and other parts of the country,” he says. Mola specialises in the production of a tomato variety locally known as Ann+1 that does well in the area. This variety is resistant to diseases and pests and can withstand harsh climatic conditions. He prepares his own seedlings in a nursery, and later transplants them to the greenhouses where he employs a spacing of 30cm by 75cm. Top dressing is then done at the rate of one table-spoon of fertiliser per plant. Mola constantly sprays the crop to prevent pests. “The challenge here is that it is expensive to pump water from the small streams into the farms. But since we have commercialised our farm, we have no option but to spend more money because it is beneficial in the long run,” he says. He also lists the common tutor absoluter disease, which invades tomato crops a few weeks after they are transplanted, as a common problem. To cut on costs, Mola uses organic fertiliser from animal wastes. To date, at least 300 farmers have visited Mola’s farm to learn from his successful venture. The former technician in the telecommunication sector has teamed up with neighbours to transform farming in Nyakach and the results are impressive. Elizabeth Akello, the director of Store Pamba Women Group, said a visit to Mola’s farm helped improve her tomato yields. “I also benefitted from the training at Mola’s farm and it changed how I run my own farm. My income from tomato farming has increased,” she says. Mola is pleased that he has been an inspiration. “What you see in my farm did not come on a silver platter. We struggled to make it a reality by putting up several irrigation projects because the area is always dry. We conducted various studies before embarking on this venture. With tomato farming, our dream has come true,” Mola says.